Who is the subject of digital rights? Digital rights organizations already number more than ecological rights or animal rights movements at their height. Together, these bodies give us a glimpse of the incipient political subject of digital rights. This text is excerpted from Being Digital Citizens (published London, Rowman & Littlefield International, 2015). 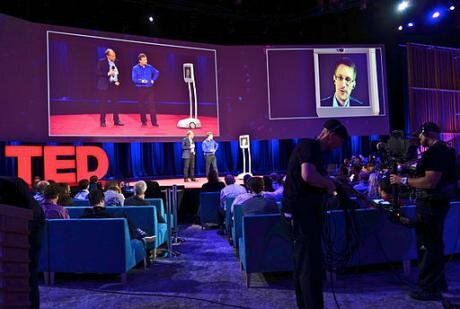 Edward Snowden calls for a Magna Carta for the Internet, 2014. Wikicommons/Steve Jurvetson. Some rights reserved. Three rights—expression, access, and privacy—have emerged as the most often debated digital rights. To these, openness and innovation have recently been added. All together, these five rights have come to constitute digital rights in cyberspace. … So the question of ‘who’ the subject is of digital rights is both an analytical but also an urgent political question that requires addressing. Julian Assange, who began his active life as a hacker, became a conduit to some of the most significant revelations of state secrets in history through a platform called WikiLeaks. He is languishing in the Ecuadorian embassy in London. Aaron Swartz began his active life as a hacker and transformed himself into a digital rights activist through various involvements and organizations and released a trove of academic articles into the public domain. In the face of an unrelenting force of the law, he ended his own life. Edward Snowden, a security contractor for the NSA, released classified information about how state agencies are involved in massive surveillance and are spying on their own and other countries’ citizens with impunity at a scale hitherto unknown. He is now a fugitive in Russia with an uncertain future. Laura Poitras now lives in Berlin as a digital exile for making a film about Edward Snowden. … Chelsea Manning is serving a jail sentence for leaking military secrets, revealing the impunity with which the wars in Iraq and Afghanistan have been conducted. Peter Sunde, who co-founded Pirate Bay for free culture, co-invented a digital payment system (Flattr), and created an end-to-end encrypted messaging system (Hemlis), served several months of a prison sentence for being a conduit in downloading copyrighted material. Ilham Tohti, a former economics professor at Minzu University of China in Beijing, began a website in 2006, which was closed in 2008 by the Chinese government; he was sentenced to life imprisonment for inciting youth online with the aim of making domestic issues international. We can add to this list of names those figures who continue to have force, such as Richard Stallman, who founded the free software movement; Jimmy Wales, who not only founded WikiPedia as a free encyclopaedia but has waged a resilient battle to keep it that way by organizing hundreds of thousands of contributors; Jacob Appelbaum, who continues to campaign for anonymous browsing for privacy and security with the Tor Project; and Phil Zimmerman, who made possible end-to-end encryption in email by fighting off the FBI’s best efforts to stop his inventiveness. These observations practically apply to all political subjects that the digital rights movement has spawned. Anonymous, a collective group that began its existence as hackers intent on pranks, quite rapidly transformed into a hacktivist group with political subjectivity. Remarkably, the public image of hackers has an inverse relationship to their acts. When hackers were more intent on ‘we do because we can’ politics, their public image was mysterious, revered, and appreciated. Yet once hackers … turned into hacktivists with political subjectivity, their public image suffered, and it became tainted with criminality. There is a lesson to be learned about how new political subjects encounter criminalization when both the performative and imaginary force of their acts come up against the force of law. Yet it is not only Anonymous or Lulzsec, its breakaway version, that the digital rights movement has produced as its collective subjects. The number of non-governmental and activist organizations dedicated to various digital rights, from anonymity to privacy and access, is staggering. They range from advocacy and lobbying organizations such as the Electronic Frontier Foundation and the Open Rights Group to activist groups such as Riseup.net and the Tactical Technology Collective. The large number of digital rights organizations—large and small—is probably already beyond the climax of ecological rights or animal rights movements and is as of yet to be collectively researched and interpreted. Taken together, these individual and collective bodies begin to give a glimpse of the incipient political subject of digital rights. These declarations have similar imaginary but very different performative force from Magna Carta-like collective declarations. A recent and powerful Declaration of Internet Freedom (also referred to as a Magna Carta for the Internet or The Internet Bill of Rights’) states, ‘We stand for a free and open Internet.’ Its signatories include Aaron Swartz, Ai Weiwei, Amnesty International, Digital Sisters, Electronic Frontier Foundation, John Perry Barlow, openDemocracy, Tim Berners-Lee, and hundreds more signers. [However,] Our primary concern is a different one. The figure of the citizen, which is a fundamental figure for conceiving politics and rights in cyberspace, is practically absent from the digital rights discourse. The key question, ‘Who is the subject of digital rights?’ goes amiss. … The bills, conventions, charters, and declarations claiming rights—with all the symbolic dates associated with them of 1689, 1776, 1789, 1835, 1945—are largely about enacting repeatedly the legality, performativity, and imaginary of rights as a contested field of social and political struggles whose both cause and effect are the figure of the citizen. Yet, ironically, this figure disappears from the charters claiming digital rights and instead is replaced by the human rights of ‘individuals’. We think that this is radically reducing the imaginary force of these declarations to affirm and assert the figure of the citizen as both the subject and agent of these rights, not merely as a subject of nationality (nation-state), or a subject of humanity (human rights), or a bearer (or holder) of rights but as a historical subject that we inherit and who has a right to claim rights. Thanks go to Rowman & Littlefield International for permission to publish these excerpts from Being Digital Citizens, by Engin Isin and Evelyn Ruppert.